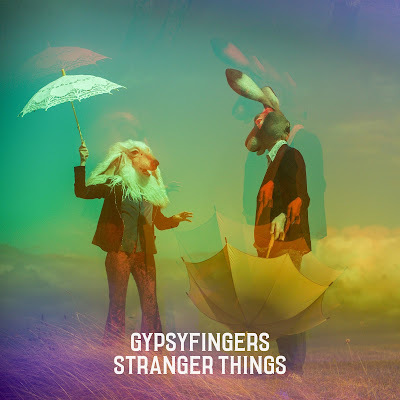 Gypsyfingers are songwriter Victoria Coghlan and producer Luke Oldfield (Metronomy, The Wytches, son of Mike Oldfield). 'Stranger Things', the second album from the folk-rock duo Gypsyfingers is representative of writers who still have a love for the album format and know how to take you on a journey from start to finish. It was recorded and produced by Luke at Tilehouse Studios, and he creates an organic feel to this record through the use of analogue tape recording and combining it with digital production techniques to produce a record that has a traditional but modern sound to it. The album opens with 'Half World'. Entering with a cinematic drum roll and vocalist Victoria singing of battle cries, this is a song depicting a struggle of significant proportion. The familiar sound of Luke's single-coil guitar pickups on the edge of breaking up and haunting "Ooo's" that echo take you through the second verse to a climactic end with a fantastic guitar solo. As the album progresses, you'll be meandering through hooks and melodies that will leave you humming along to the sound of violas, pianos, thick vocal harmonies and slide guitar to mention but a few of the surprises Gypsyfingers have in store for this album. Expect moments of intimacy in songs such as 'Blue Sky' & 'Still In It' and elation through the chugging of warm-bodied acoustic guitars of 'Quit The Game', where Victoria has a chance to show us her ability at both singing and spoken word. We recommend you catch the full band live!